Baler vs compactor is a common decision that business owners have to make when trying to determine the best waste management system for their businesses. In fact, it is so important that it could actually mean the difference from getting recycling right for your business and not having your needs met entirely. If you need to regularly handle waste material at your business, a waste compactor or baler will help to make your task a lot easier. Here are the differences between a baler and a compactor so that you can choose the right option for your business. A baler is an ideal choice for condensing recyclable materials, including paper, plastic, cardboard, and metal, so that it can be resold to recycling companies. A baler works by mechanically compressing the waste down to a small bale and then binding it to make sure that it retains its shape. The bales of waste can then be stacked neatly as they are transported to the recycling facility. Vertical balers are designed to handle small to medium volumes of recycling waste and can be operated by one person. Semi Auto Horizontal Balers are recommended for business sites that create high volumes of recyclable material. Stockroom balers are a good option for retailers given that they are compact in size. After installing a baler, you will find that the amount that you're spending on managing waste will decrease as you increase the amount of recycling that your business does. In addition, a baler can also help to create a neater work environment with recyclable waste being removed from work areas. A compactor is used to compress unsorted mixed waste into a container. This waste is then collected by a waste collector and disposed of. A compactor is simply used to reduce the volume of waste so that it takes up less space. 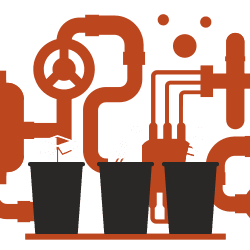 By compressing waste materials, you can also reduce the number of bins and space that is required to manage the waste that is created by your business's production activities. Compactors are also available in several sizes and are capable of reducing 3 cubic metres of waste into a single cubic metre of waste. With options available that are automatic, compactors don't even need to be operated by your staff and require less employee training. If you have questions about our cardboard recycling options or you would like to request a quote, contact Orwak Compactors today on 03 8792 9777 or email us at info@orwakcompactors.com.au.